Day five of our adventure began at the Culture and Relaxation Park in the name of Gafur Gulyam, a large public garden dedicated to the memory of a famous Uzbek poet and writer who lived from 1903-1966. Roughly two thirds of the space is given over to an impressively large quantity of amusement rides and inflatables that have been shoehorned together without even the vaguest hint of a master plan. The vast majority of the area is covered by thick trees, resulting in a veritable rabbit warren where a group could easily become separated. Our first stop was at a coaster that looked from a distance like a gravity-driven Golden Horse Fruit Worm. It was only when we got closer that we realised that Olma Qurti (Apple Worm) was actually a powered knock-off that lacked a lot of the refinement (yes, really) of the common Chinese design. There was no dedicated power rail; instead, the track itself was electrified with wooden sleepers separating live and neutral. The operators were somewhat taken aback at our desire to ride, but they quickly saw the funny side and allowed us to partake in groups of two. They advised us to duck as we passed through a fiberglass apple slice, and while this wasn't strictly necessary it certainly made for some entertaining photographs. Our second stop was at O'rmon Sarguzashtlari (Forest Adventure), our fifth slightly different twin helix powered coaster in two days. This model was probably the only one of the five that would have a chance of being cleared for use at a western park, as the electrical pickup was safely located underneath the train body. Each car had a loose fitting seatbelt, though once up to speed the strong lateral forces were more effective at holding us in place than any physical restraint could have been. I particularly liked the figurehead on the front car, which featured a fiberglass child with raised fist hanging onto the back of an angry dragon. We spent perhaps thirty minutes exploring the park, and found a number of curiosities. There was a copy of the Mondial Top Scan, probably of Chinese origin, whose support structure looked far too flimsy for comfort. It would have been interesting to watch it operating in parallel with the Orbiter beside it, as the clearance between the two rides was somewhere between minimal and non-existent. An inflatable dart board (deflated!) reminded me of some of the Kerryman Jokes I enjoyed during my misspent youth. Last but by no means least was an increasingly rare example of a Huss Ranger that once toured in Europe; it was interesting to see it still wearing English language titles that presumably date from when it belonged to John Crick. The Expo Centre complex is a large entertainment facility in the Uzbek capital that was one of many projects initiated by the authorities in the immediate aftermath of the breakup of the USSR in 1991. The place has grown over the intervening years, and now includes a conference centre, an upmarket restaurant, a Japanese garden, a water park, and a small amusement park. An aerial ropeway routes around the edge of the site and provides some excellent photo opportunities including the only worthwhile shots of the coaster; as of this writing an adult ticket for the twenty minute journey costs 15000 soʻm (~€1.65). Tashkentland is unique among the amusement parks of central Asia in that virtually all of its equipment is of western origin. Adult admission costs 30000 soʻm (~€3.30), a price that includes unlimited use of all eleven attractions. Though cheap for tourists this figure equates to around one percent of the average monthly salary in the area, putting it in the same bracket for local visitors as many smaller European parks. The place wasn't busy today, though the 43°C temperature probably had a lot to do with that; one presumes that business is somewhat better when it isn't brain-meltingly hot. The ride has been installed on a sliver of land directly adjacent to a lake. A sizeable portion of the layout is actually above water, and the result looks particularly good, if potentially problematic in the event that the train were to valley. An equipment room has been placed between the two spikes, and though a narrow queue was routed around it a padlocked gate and holding pen was added later, presumably to avoid issues with claustrophobia (and more rotund visitors getting wedged). Today signage indicated that there would be one dispatch every fifteen minutes, and sure enough an operator opened the gate precisely on the quarter hour to allow us up to the station. The train is the standard Vekoma design of the early nineties, with wide seats and heavy overhead restraints that locked around two inches away from my body. Each restraint was checked independently by two different operators, an interesting safety precaution that I've not seen before, though otherwise the boarding process was no different to anywhere else in the world. Once we were dispatched I decided to adopt a defensive riding technique in the interests of self-preservation, though I'm glad to report that my precautions were unnecessary; the comfort level was well above average for the genre, resulting in a surprisingly good ride. Megan and I decided it was worth doing a second lap on the grounds that we probably wouldn't be back any time soon. Our next stop was at Horror Castle, an elaborate two level dark ride that the park web site describes in wonderfully broken English: "where light and sound effects are used successfully unless you slightly irritate your nerves with an unexpected appearance from the darkness". Its facade consists of sculpted stone battlements decorated with an oversized animatronic gorilla on one side and a dragon figurehead at its center that opens its mouth every thirty seconds or so. The vehicles were relatively spartan, comprising plain grey benches on a black base, though this minor weakness was quickly forgotten as we began to take in the various scenes. The standard of presentation was excellent, even if the subjects were a little unusual; I'll just say the words "copulating skeletons" and let readers' imaginations do the rest! The largest ride in the park by physical area is Afrika Safari, a boat ride that is probably best described as a low budget version of Disney's Jungle Cruise without compunctions. The five minute long cruise routes past a wide variety of static and animatronic scenery, ranging from the prosaic to the mildly shocking. One particularly memorable set shows a pride of lions that have attacked and killed a zebra that lies bleeding and forlorn on the ground. 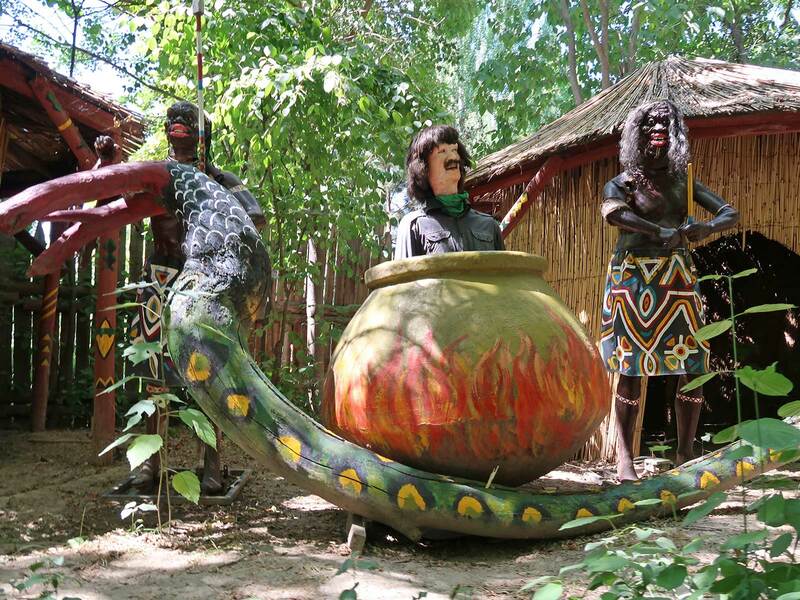 Another shows dark-skinned natives boiling a white man in a cauldron, though the victim's facial expression indicates mild constipation rather than extreme pain. The ride finishes with what was presumably intended as a happy scene, showing a man in a ridiculously colourful shirt playing the banjo. I'd personally have preferred if the banjo player had been immolated, but that's just me; I've always understood a gentleman to be someone who knows how to play the banjo but promises not to. The one other ride on our hit list was the Giant Wheel, though we need not have bothered. Tall trees on two sides of the structure meant that there were basically no worthwhile photographs from on board. The one positive was the fresh breeze at the heights which gave us a few minutes of respite prior to our return to the ground level sauna. The city of Tashkent has two parks that carry the Lokomotiv Park name, known locally as the "old" and the "new". Our driver refused to follow our directions, apparently because he was convinced that our GPS coordinates were wrong, and thus we ended up at the new park (41.3280, 69.2681) rather than the one listed on RCDB. We spent ten minutes confirming that there were no roller coasters on site before returning to our minibus for the nine kilometre drive to the correct location. Tempers were quite frayed as the result of the wasted time; several members of our party let off steam by exploring their superior command of ancient and modern invective. In due course we arrived at our target, which we quickly determined to be a collection of Golden Horse hardware. 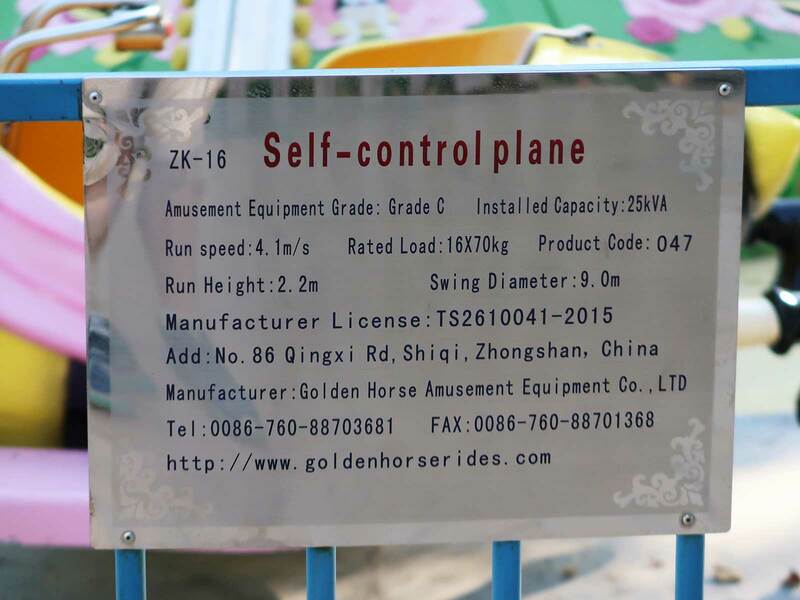 Almost all of the machines had distinctive silver plates with functional names and an address in Zhongshan, China; my favourite was the self-control plane, a flat ride for children with cars themed to bees. We confirmed that there were two roller coasters present, and armed with that information our long-suffering guide procured us a ride card with the right amount of credit for both. The purchasing process took quite a while; I rather suspect that guests without conversational Uzbek would have gotten nowhere fast. Tick number one was Spinning Coaster (#2461), an installation of the ubiquitous Chinese knock-off with loose-fitting lap bars, seat belts, and backup chains. As of this writing an incredible eighty eight versions of the copy are known, in comparison to just four of the infinitely superior original. We boarded with no expectations whatsoever, and that may explain why we actually enjoyed ourselves; our carefully unbalanced car managed a reasonable amount of spinning, and the straightening device at the end wasn't as awful as on some of the earlier models. With that done we made our way to Gusenitsa (#2462). The operator on duty clearly did not want to let us on board, but fortunately the signage came to our rescue as it stated in both English and Russian that those over 0.9 metres in height were permitted to ride. This was almost certainly a translation error from the original Chinese, given that the specification plate quoted a design load of 40kg per car, but that minor detail was ignored. Our guide negotiated on our behalf and in due course got us the required permission. The experience of my fifth utterly pathetic Fruit Worm was never going to displace existing entries from my top two thousand coasters, but it was good to box it off nevertheless. 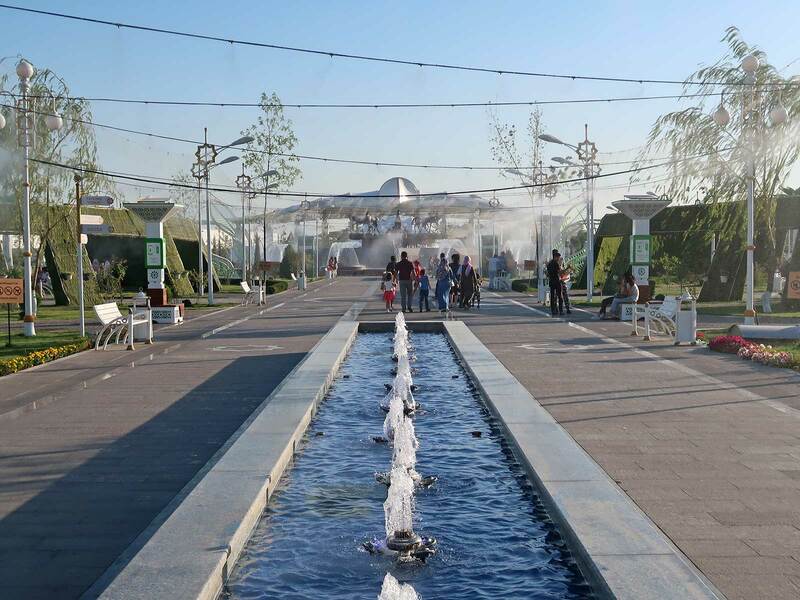 Ashxobod Sayilgohi is a brand new park that is themed to resemble Ashgabat, the capital of Turkmenistan. It is accessed through an enormous white marble arch with gold trimmings, marked by a number of statues of Akhal-Teke horses. This leads to a wide path with fountains in its centre and elaborately decorated street lamps. The effect is completed by a replica of the spectacular falcon-themed airport terminal that we'd experienced in real life earlier in the week. 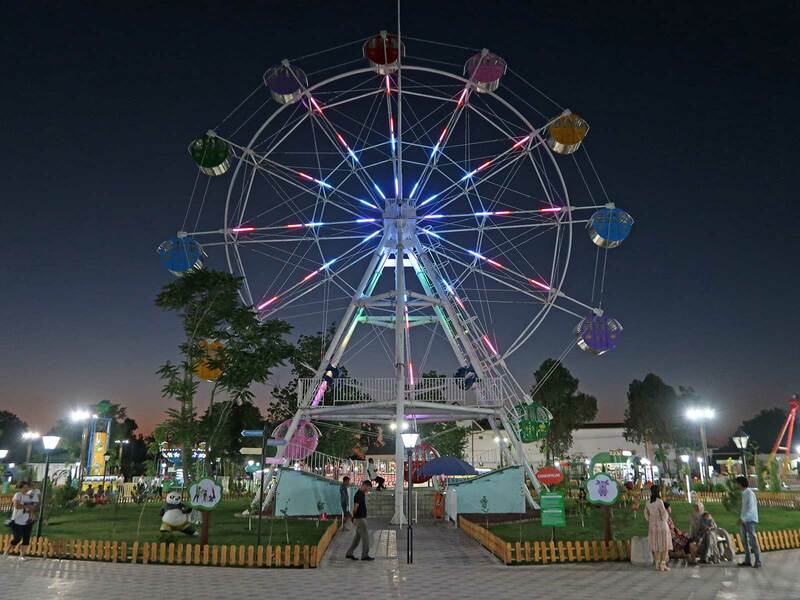 Much of the facility is given over to a collection of brightly coloured family rides, all of which have been surrounded by official green fencing decorated at both the top and bottom with a gold-coloured Emblem of Turkmenistan. In the run up to our trip I found a number of online videos of the park, though for whatever reason the two attractions that I thought might be roller coasters were never quite in shot. The only solid data that I had to work with was an out-of-focus photograph of a ride list and Google Earth imagery that was only good enough to justify an in person inspection on the ground. Quvnoq Tepalik (#2463), or Funny Hill, turned out to be a Chinese copy of the common SBF Double Coaster, and in all honesty we'd have been tempted to call it the genuine article had we not seen the operator's control panel, which was labelled in both Mandarin and English (and which had an embedded MP3 player for entertainment). The yellow and blue cars were decorated with small pictures of cartoon characters, including Disney favourites such as Pinocchio and Mickey Mouse and a number of others that I didn't recognise. The only really strange feature of the design was the safety barrier, which encompassed the access route to the station; after passing through the turnstile guests could quite easily touch the ride track, which wouldn't pass muster in western countries. The ride itself was fine, if unmemorable; I lost count of the number of laps we were given. G'aroyib Sayohat (#2464) looked at first glance like a mutilated version of the Zamperla Mini Mouse with spinning cars; the layout featured shallow ascents and descents and there were a number of tyre drive motors in key locations to obviate the risk of a stall. The top speed scarcely exceeded walking pace, but despite that the train clattered its way around the course in a way that only a Chinese ride can. One of the turns towards the end of the course was positively brutal, leading me to question whether the wheels on my car were actually round. The name Amazing Travel felt entirely inappropriate; I think Noqulay Sayohat would be more appropriate (you can translate it, I'll wait). Readers should be aware that this ride is officially only open to children, and while we didn't have a problem your mileage may vary. Though we didn't do any other rides we did decide to grab a quick bite to eat. Readers of an adventurous disposition are encouraged to seek out the park's rather bizarre hot dogs, which are very tasty but definitely not what a foreign visitor would expect. Mine featured spicy salad cream and what I think (hope?) were pickled onions amidst the typical ketchup and mystery meat. Megan advised me to abstain pointing to the risk of undesirable after effects, though on this occasion at least I got away unscathed. 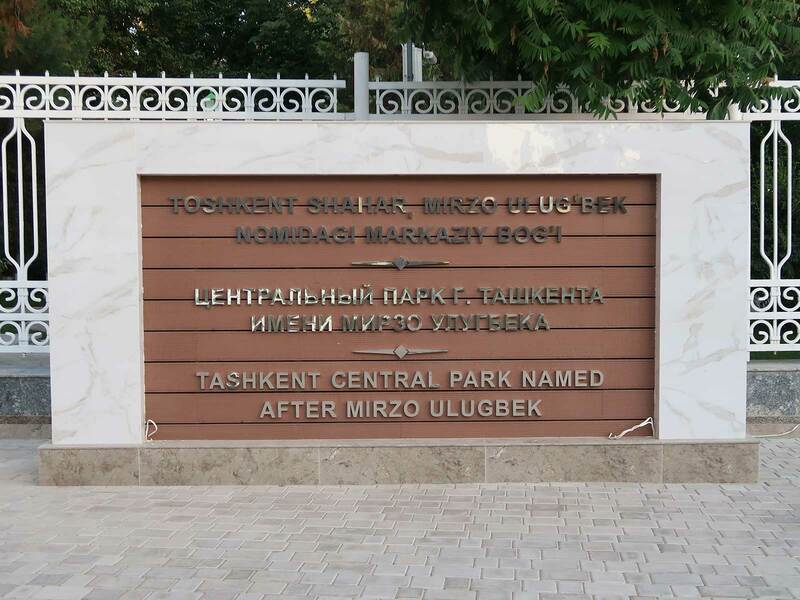 Tashkent Central Park is known to locals as Mirzo Ulugbek Park, after a fifteenth century astronomer, mathematician, and sultan that once ruled most of central Asia. Amusement rides have been a feature of the place since the seventies, but there were no coasters in the mix until earlier this year when the local authorities decided to install three as a part of a significant upgrade. (The park was added to our trip just days before travel when I spotted a partially built coaster in Google Earth imagery. I sent the details to Duane Marden, who turned up pictures of the other two on Facebook. It was a rare treat to get three finds for the price of one). Our first stop was at the imaginatively named Coaster (#2465), one of four worldwide installations of the 30x14m Family Coaster from Preston & Barbieri, and my first encounter with the type. The design is just short of twenty feet high, putting it a few notches above a Wacky Worm but still very much in the junior category. Despite diminutive statistics the experience had plenty of life to it; the tyre drive lift moved quickly, the first drop was respectable, and a sharp turnaround after the second drop added an unexpected thrill that was particularly dramatic towards the back of the train. We were given two laps for our trouble. Though we didn't realise at the time we'd actually ridden the best coaster in the park and the only one that I'd consider making a return visit for. 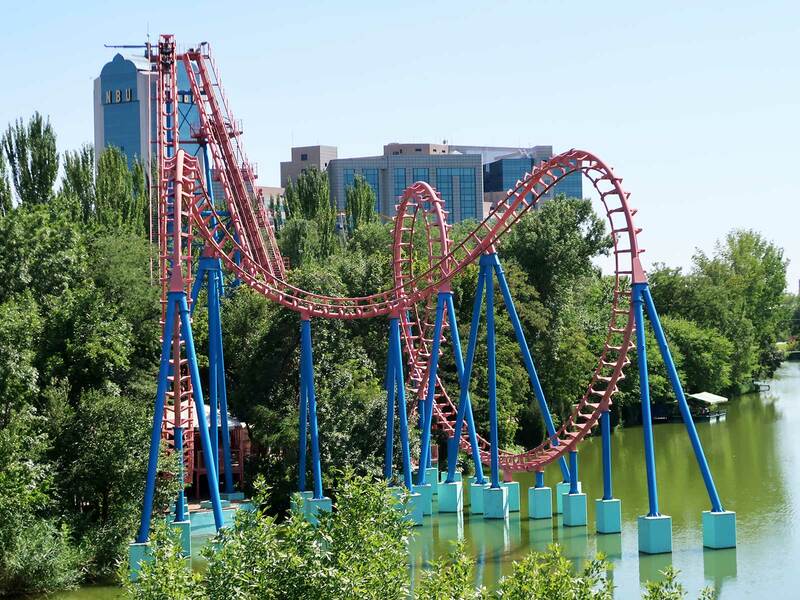 Cyclon Coaster (#2466) was largely forgettable, partially because it was my fourth Galaxi equivalent in less than two months, but mostly because it fell far short of the magnificent installation at Borjomi. It featured four person cars with a shared lap bar across each row and individual over the shoulder seatbelts. It was tracking smoothly enough today, but the train never picked up a whole lot of speed rendering the experience largely flaccid. Our final stop was 3 Loops Coaster (#2467), a compact spinning coaster that was only ever likely to be a box-ticking exercise. The extended version of the standard figure eight design looks interesting, but at the end of the day the guest experience isn't radically different to the smaller (and cheaper) model, and this has been reflected in the relative sale numbers. If anyone from SBF is reading this, have you perhaps considered intertwining two tracks? Duelling trains weaving above and below each other could be fun, with the added benefit of significantly increased rider throughput. While I dream, it might be fun to have a special thrill-seeker mode that increases the drive motor speed; it can be done! 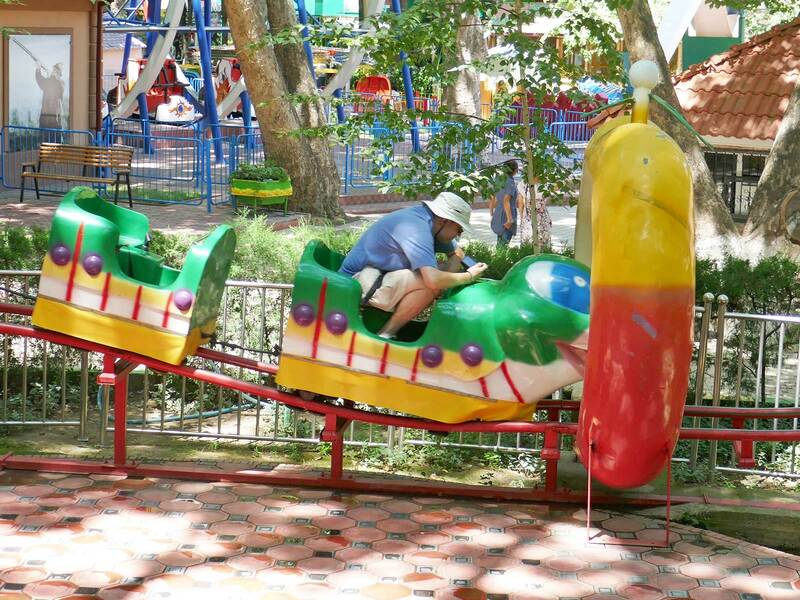 Do'stlik (Friendship) is a relatively new family park on the eastern side of Tashkent, and an absolute nightmare to get to. We had an exact location on GPS but no street maps, so we were not able to offer much help to our driver. He decided to take us along a back road through a housing compound, providing us with a view of Uzbek life that isn't typically mentioned in the tourist guides, and though the distance to our destination was counting down I was quite sure that we'd end up at a boundary wall rather than an entrance. It wasn't until we were less than two hundred metres away that the road abruptly improved and we arrived at a large parking area. Unfortunately our visit was a write off. We found a double helix powered coaster named Uchar Pegas, but we were refused permission to experience it for ourselves due to a strictly enforced 6-12 age limit. The operator told our guide that there was a CCTV camera pointing right at the station, and that he'd be out of a job if he let us on board. Though I'd have preferred my tick it was definitely the ride I'd have chosen to miss, given that we'd ridden several very similar attractions a day before. We had hoped to conclude our day at Quyoshcha Nuri, but the tour company in charge of the Uzbek leg of our trip advised us that we would have to pay a USD $20 supplement per person (or a total of USD $120) for the eight kilometre detour from Do'stlik. We felt that this amount was excessive for the distance. We did consider hiring a local taxi, but we were tired, and decided in the end that it was too much effort for what was most likely to be another powered coaster.